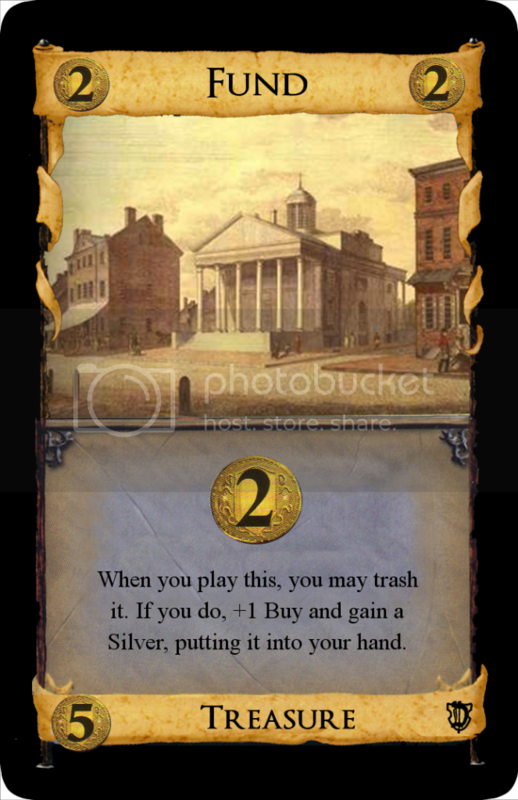 1) Put a clause in the text so that you cannot gain Mill Towns with Mill Towns (and remove the at least 3 Coppers clause) because my feeling is that more problems arise from quickly getting too many Mill Towns than running out a $2 pile. 2) Change "discard a card" to "discard a Copper or reveal a hand without Coppers," reducing the power of multiple gains. Well, change 2 pretty much kills the card dead in any game without Tactician or Counting House. You'd pretty much never want it. So that's not a change I'm willing to make. I'll have to think about change 1. It's possible I can do something along those lines. 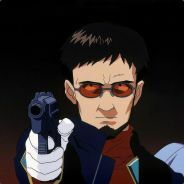 I also might play a few games with Tactician and see how much of an issue I think it is. I've completed my post-Dark Ages overhaul of Dominion: Enterprise. This is the third major iteration of this set and I decided to keep the same thread this time, rather than create a whole new one. Surveyor and Gambler received wording changes but are functionally the same. Gambler now has you look at the top card of your deck rather than revealing it, since the reveal wasn't necessary to keep you honest. Boycott got bumped from +$2 to +$3 when played to give more incentive for going for it. I may also add a +1 Buy. Mercenary got a name change to Enforcer because of the Dark Ages card with the same name. I've replaced Aqueduct with Floodgate. They both fulfill the role of, "buy this to make your next hand better", but Floodgate is far more compelling and versatile. Barracks lost the parentheses around "from the Conscripts pile". I jazzed up Conscripts itself to make it worth gaining when the Curses have run out. It used to just read, "+$2. Trash this card. Each other player gains a Curse." Now you get to choose two options from a list of four. Also, Barracks and Conscripts combo a bit better this way. If they collide, you can use Barracks to dig for another Attack card, then use Conscripts to give out a Curse (or whatever) and then play the other Attack card. Also, rather than Conscripts trashing itself, it now goes back to the Conscripts pile. Finally, the Conscripts pile is 16 cards, using up the remaining cards in the hypothetical 150-card box. I'm a bit worried that Conscripts will still be too weak. It is a one-shot that you sacrifice quite a lot of time to acquire. I might try it with the '+$2' and 'gain a Silver' options replaced by '+$3' and 'gain a Gold', but that might not be necessary. Cursing is powerful as-is. I've cut Cathedral from the set entirely. It was too similar to Courtyard and way too powerful for simple big money strategies. In its place I tried 3 different cards that I've posted to this forum, and for now I've settled on an updated version of Exchange. It still needs some more playtesting, but it's the card I like the best so far in this slot. I'd like to have a Remodel variant and it's also nice to have another pure one-shot in the set. Fund has received another major overhaul. I pulled the cost reduction in favor of just having it produce +$4/+1 Buy once as its one-shot effect, deciding that wasn't too powerful for $5 after all. I also incorporated Cathedral's 'one-shot that doesn't leave your deck' idea into it. See, it's a Silver that you can use once for the extra cash and buy. Then it just reverts to a regular Silver. 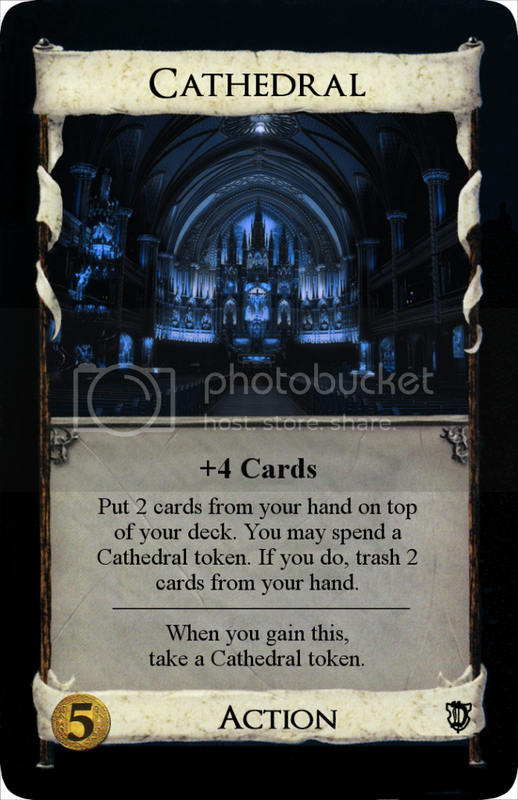 This was a way I could do this concept without using tokens, which I had to use for Cathedral. If possible, I'd like to have this set be free of extra components. Inventor is almost functionally identical to its most recent iteration. Before you either drew 3 cards or +1 Action and set it aside on your Inventor mat, where you could pull it back to your hand at the beginning of any turn. I realized that this is pretty much the same as having it just return to your hand at the start of your next turn, since you could then just set it aside again at no penalty. That way it wouldn't need a mat, so I made the change. Tax Collector lost its +1 Buy (which felt tacked on to me). That leaves the set with only one +Buy card (Fund), but I might be OK with that in a set with so much gaining. Also, the attack no longer hits cards costing $2. I think it needed that buff, but more playtesting could prove me wrong. That's it! Thanks once again to everybody who has given feedback and suggestions. You've helped make this set as good as it is, and it's a set that I really enjoy playing. So, thanks again and thanks in advance for any future feedback! I just found out that maybe Exchange has a problematic wording: Trash this .... For each trashed card gain ... Does this mean that I get $7 card? One question: Isn't BigMoney + Inventor (where you always buy it at $5 and maybe sometimes at $6) very strong strategy? Heh, good call. I may have to reword that. Well, that's a good question. I'll run a test to find out. Thanks! In Big Money I don't see Inventor being all *that* strong. Catacombs seems quite a bit stronger, for instance. Edit: oh, I didn't notice that you get +1 action if you "haven" it. yeah, it is seems rather strong now, since that prevents collisions. If you just have Inventor top deck itself along with the +1 action, then you would get a similar sense of saving it for later, but only if you don't continue drawing now. It's not a statistically significant sample, but preliminary tests suggest that BigMoney/Inventor is way, way weaker than BigMoney/Envoy. Part of it is that Inventor costs $5, which is significantly more expensive than $4 and also means that you can't open Inventor/Silver. Another part of it is that, while Inventors in hand don't collide, any Inventors you draw dead are still dead. I'll run some more tests, but I'm not too worried at this point. It wouldn't surprise me if it ended up being weaker than BigMoney/Smithy on average. Well, I believe that the proper way to compare it with BM/Smithy is to buy one Smithy and then Inventors after that. I think this hybrid should beat both BM/Smithy and BM/Inventor. Really? Why? That assumes that Smithy and Inventor are always going to be on the same board. Even if it ends up being a powerful combo, I don't think that says much about Inventor's power in a vacuum. If BM/Smithy and BM/Inventor are competing against one another, it means both Smithy and Inventor are in the supply. Unless one of the those BMs is Black Market. But often people would say that if X beats Y then X fares better against Z then Y would. This is often not true but I think that it is a reasonable starting point. So if you want to compare BM+Inventor against some (average) strategy X you can do BM+Inventor vs. BM+Smithy and extrapolate from your "intuitive" knowledge of BM+Smithy. In this sense it is reasonable to prohibit BM+Inventor from buying Smithy since against X it need not be available. Yeah, the speed of BM+X is more of a benchmark than anything. How fast can it get to 4 Provinces, 5 Provinces, 8 Provinces, etc. The worry here is that BM+Inventor is too powerful, which is concerning because it could make for really boring games where everyone just plays that strategy. However, if I determine that BM+Inventor is no more powerful than BM+Smithy or BM+Envoy, then I'm OK with it. Smithy+Inventor is starting to get into combo territory, and I don't have any issues with that. I think this is really the first time I like fan made cards other than mine ! Well, not all cards, but Mill town, Floodgate and inventor seems especially promising. Good job ! EDIT : Oh, sorry I forgot Boycott. I think it's even my favourite of your set ! I don't think Inventor+BM is too strong. It's somewhat similar to Library+BM, but reverse. 2 Libraries in hand could collide but you can't draw Libraries dead. 2 Inventors in hand can't collide, but you can draw them dead. I played with Inventor several times in my group, and basically any board with +2 actions would yield Inventor extremely powerful, such that it was almost a better investment than some of the best $5s in the game. I think the power level of the card could be adjusted by having the Inventor set back on top of your deck instead of off to the side, because basically as written you wind up with a card advantage on the following turn (6 cards instead of 5) and you can continue to set it aside forever at no opportunity cost whatsoever if you don't get the +actions draw that you need. What a wonderful Fan-Expansion! Really like the new ideas which seams all well-thought-out. Professional work! I have a Mod-Suggestion for the Inventor which obviously is a bit too strong for some players. Set this card aside, returning it to your hand of the start of your next turn. So it's much more difficult to set aside more as one Inventor but it's still possible if you have enough actions or you can play some Inventors before with a 'village' which certainly increase the chance of holding to many of it in hand. The annoying case of holding only one Inventor in hand without 'villages' gives you the set-aside-function and the action for another action card in hand (similar to Shanty Town without action cards in hand). Haven't had a chance to read through the whole thread, so not sure if this has been discussed... just wondering if you've had a chance to test these along side Graverobber or Rogue. It seems to me that one-shots in general may be more powerful when there is the possibility of getting them back. I suggest you change up Clerk a bit, the action part is a bit too similar to Scavenger. Maybe it's fine though. Still love your cards LastFootnote, nice job! Hey, welcome to the forums! Thanks for testing Inventor! I might test it a bit more in its current form, but now that I've gotten feedback from multiple people about it being too powerful, I'm thinking seriously about tweaking it. Since you've tested it, your feedback is particularly valuable, so if you have anything else to add concerning Inventor, or if you decide to test any of my other cards, please let me know! I appreciate the suggestion! However, I'm worried that it's a bit confusing and I can't think of a rewording that would really simplify it. However, I will definitely keep it on the table as an option. Currently, I'm considering two other ways to nerf the card. Choose one: +3 Cards; or +1 Action and put this on top of your deck. Choose one: +3 Cards; or set this aside, returning it to your hand at the start of your next turn. Right now I'm leaning strongly toward Polatrite's version. It has some weirdness in that you could play the same Inventor multiple times in a turn, but now that I think about it, Procession/Fortress does that too. With that change, multiple Inventors can collide, because if you put one back on your deck, you'll just draw it dead with the other one. However, you could put them both back and hope there's a village in the three other cards you draw next turn. The more I think about it, the more I like the strategy it could create. I just hope it's still strong enough to be a decent $5 card with this nerf. I haven't tested those combinations yet, but they sound like fun! I definitely think that Graverobber (and to a lesser extent Rogue) combo well with one-shots, although the pedant in me would argue that those cards don't make one-shots more powerful. Rather, one-shots make those cards more powerful because they make it far more likely that there's something worthwhile in the trash. But that's just me nitpicking. Your point is perfectly valid. …You're probably right. It's just a shame because it took so long for me to come up with Clerk's top half. It's an effect that doesn't really change in utility with the number of cards in your hand, which is nice on a reaction that can leave you with a very small hand. Although it might be nice to have that reaction on a card that doesn't fill your deck with Silver, which tends to get in the way of the trashing. On a side note, I do think it's interesting how Donald and I came up with different ways to make sure the 'pull a card from your discard' effect didn't fail. 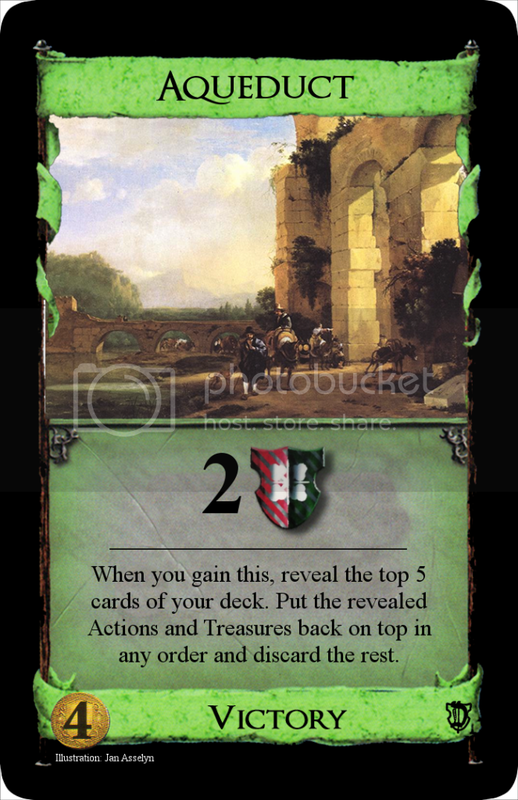 Anyhow, I'm thinking of replacing the top half with a card idea I came up with a while ago, which I called Valet. Look at the top 2 cards of your deck. For each one, in either order, choose one: draw it; or +$1 and put it back. When another player plays an Attack, you may reveal this from your hand. If you do, trash any number of cards from your hand. How does that strike you? Now that it has the trashing reaction, it's even more like a variation of Steward. The +Cards and +Coins part is much more versatile, but it can only trash when an Attack is played. Weird. Anyhow, thanks again everybody for your encouragement and feedback! Are you really worried, my version would be a bit confusing? Do you mean it serious? I mean Possession with Dark Ages cards could be very confusing but to look if there is another Inventor in hand isn't more confusing as a Shanty Town. 2. Same as 1. but you have another action card in hand and can play it. 3. You have more than one Inventor in hand and also other action cards. You can choose +3 cards or set only one Inventor aside and cannot play another action card or you can think if it's more worthwhile to play another action card first. 4. Same as 3. but only Inventors in hand. You can set aside only one Inventor and cannot play another. Or play an Inventor like a Smithy. I think this is really easy and it would be fun to think about playing it mostly productive. This would definitly be a 5 cost card cause the possibility to set aside more than one is still there and you can get more than 5 cards at beginning of your turn. At Polatrite's version I don't know why I should put more than one or two of it on top of my deck. It more and more decreases the chance of getting it together with a 'village'. If there isn't a way to get more than 1 action then a carddraw after putting Inventors on top would make absolutly no sense and no fun. For example Inventor and CanTrip in hand. The only wise would be playing the CanTrip first then the Inventor to put it on top (otherwise draw dead problem). The other way around you would draw the Inventor instead of a new card, not a good move. The costs for this version would probably be at 4.5, a weak 5. Option 2 would also be too weak and not really fun. Hope to see your expansion someday as real cards from RGG. After Donald has finished his series maybe an official Fan-Expansion existing of FanCard-Contests winner cards could come out. Perhaps Donald was asked something like that before? I'm concerned that this reaction is too strong. The problem with very strong attack reactions is you having this makes me not want to buy attacks in the first place, and then your cool reaction ability never happens, so you won't want to buy this card. I don't think Clerk needs to have its ability changed from "Gain a Silver. TopDeck a discarded card". If anything, a discard should be required when using the trash any number reaction. I had a trash reaction in mind for a card; I didn't use it because I had seen Clerk, but that reaction was set itself aside and 1 trash. It got your hand size down to 3 for Militia, Ghost Ship, etc. Maybe 'confusing' is the wrong word. It's more like, if a card gives you two options, it seems…weird to me that if you choose one option, you then reveal your hand and it's like, "Oops! You can't do that option after all." I mean I understand how the card works. If you have another Inventor in your hand, you just wouldn't choose that option. Like if there are no other Action cards in your hand, you wouldn't play Gravedigger for the trash-and-gain option. So it's not unprecedented. It just seems awkward to me. I think 'awkward' is a better word for how I feel about it than 'confusing'. Actually, now that I look at the card and your description again, I realize that I didn't understand how it worked. So if you choose the set aside option and reveal an Inventor, you still set it aside, but you don't get the +1 Action? It wasn't clear to me which parts of the instructions would happen under which circumstances. I really appreciate the idea, don't get me wrong. It's possible that the card will end up incorporating this idea. I just have concerns about it. 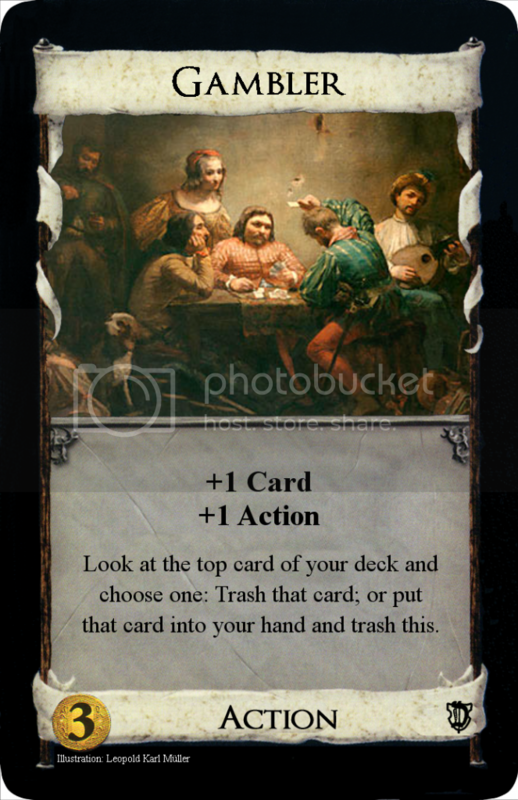 The reason I've stuck with revealing the card rather than discarding/setting aside is that I wanted Clerk to have the ability to trash itself once it outlived its utility. That being said, I don't think it's ever happened in a real game, so I should probably let go of that idea. I really like your version of the reaction. Would it be OK if I adopted it? I'd at least like to test it out. As far as changing the top goes, I guess it wouldn't be the end of the world to leave it the way it is and have it be similar to Scavenger. It's less unique than it was, but it certainly plays differently. Now you understand it. I think the card text cannot be clearer. If there is a 'Choose one' all until the 'or' is the first option, then the rest until the next 'or' is the second option and so on. If you cannot set aside one Inventor if there are other Inventors in hand it would be really dumb. Such a thing I wouldn't put on a card. Trust me, I have some experience in card design. I only want to limit the too easy way to put all aside for the next turn without thinking. Reveal your hand. If you have no Inventor in hand: +1 Action. But then someone maybe could think that the reveal counts for both options. Would it be OK if I adopted it? I'd at least like to test it out. You are more than welcome to. Happy to help.